Is there Windows 3.2 in English instead of Chinese? No. "3.2" is Chinese only. Unless someone modifies it to be in English. I would, but I don't understand Chinese, so no. You can try to translate it via using the International option in the Control Panel, but then the font will get messed up. Windows 3.1 034 setup appears to lock up after Disk5 and I tried copying all files from fixes disk to c:\windows and when I typed WIN it locked up again on the splash screen. No there is NOT because i dont speak chinese. No, and it would be pointless. The only difference between 3.1x and 3.2 is that the latter has Chinese support. You could try installing an English font, but no guarantees that this will work. Do you have the wrong checksums listed or have your files been corrupted? I think they're just wrong-- I've downloaded these before and everything worked fine. This is a known issue. The SHA1 checksums in our database got borked. The files are fine and unchanged. 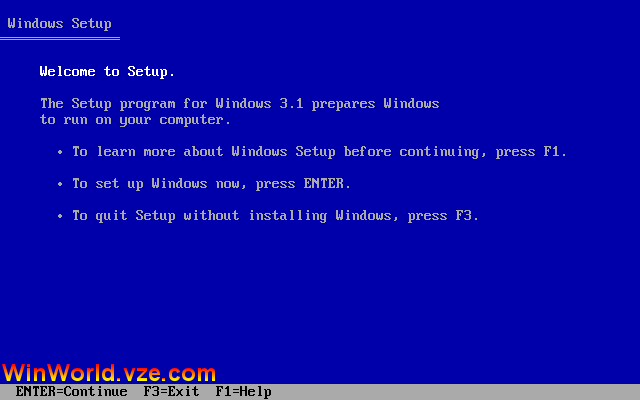 How do I install the Windows 3.1 [English for Central-Eastern Europe] (1993) ? Not all of the Windows 3.1 archives are in floppy disk image format as they should be. For those that are not, you must put all of the installation files in a single folder on your target hard drive or larger removable media and run setup from there. There are a variety of ways to do this, if you need more assistance, please post in the software forum. Don't use VirtualBox for Windows 3.x or below. Use PCem or DOSBox and install CD-ROM drivers on there. what is the windows 3.2 red china version? was it intended for use by the chinese government and city councils and stuff? Not all of the Windows 3.1 archives are in floppy disk image format as they should be. For those that are not, you must put all of the installation files in a single folder on your target hard drive or larger removable media and run setup from there. Are you saying that Windows 3.1 only works when it is in the floppy disk format? Because I have an ISO image for Windows 3.1, which is in a CD format, and it worked when I used that to install Windows 3.1 in VirtualBox. I'm saying Microsoft never distributed Windows 3.1 on CD-ROM. Therefore any CD images are FAKE. Well, like BF10 said, you can translate the entire system to English using a language driver in your hypervisor, but that can screw everything up, such as the word fonts. 3.1 to floppy disks ? You don't convert an archived file to floppy, CD, or DVD. When a file is archived, it just means that more than one file has been packed into one package, such as a rar file or 7z file. You have to unpack an archived file with a file archiver like 7-Zip, and then you will find the disk images for that operating system or software. Unless you mean you want to convert the disk images to real floppy disks, then you can use something like ImgBurn or UltraISO. I guess that's not exactly what he means. I think you want to put all files in their respective floppy images, e.g. "convert" 31 files of Win31 into 6 or 7 floppies. It is an easy task. You need another copy of the Win3.x images (E.g. The floppies to install Windows 3.1), never mind the language. Once you have them use a tool like WinImage to put in new floppy images the archive files that were in the original floppies, e.g. "If file ABC.EXE is in Copy-A of Windows 3.1, then I'll search the file ABC.EXE in the archived 31 files, then I'll put the ABC file in a new floppy image" and so on with every floppy. Sorry if I didn't explain right, English isn't my main language. If they are talking about the “MSDN” garbage that is not split up in to floppy images,. There is no good way to put them on floppy disk images. The problem is, you have to know which file goes on to which disk, and although the setup.inf references most of the files, the driver files on the later disks have independent setup files. Extra pain in non-English versions. So unless you luck out and come across a file listing for the specific language in question from some old MS Knowledge base article or something, there is no good way to know where each file is supposed to go. That is why we prefer floppy disk images in the fist place. So people who do need disks don’t have to jump through hoops. Anyway, the common workaround is to just copy or zip up the setup files in any order across a number of disks and then restore them to a folder on the hard drive. Then run setup from the folder on the hard drive.